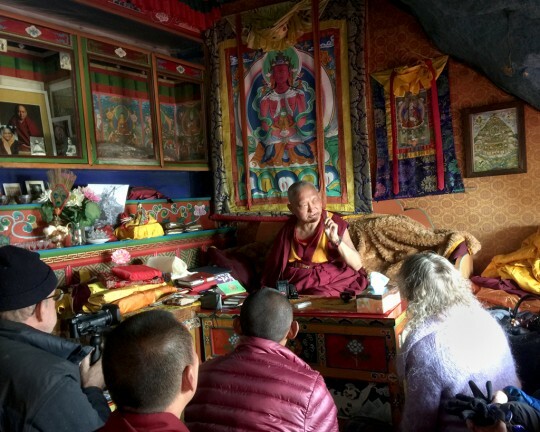 Lama Zopa Rinpoche teaching in his cave at Lawudo, Nepal, April 2015. Photo by Ven. Roger Kunsang. In early April 2015, Lama Zopa Rinpoche visited Lawudo, near Mount Everest in Nepal’s Solu Khumbu region, which was the home of his previous incarnation known as the Lawudo Lama. During the visit, Rinpoche taught in the meditation cave of the Lawudo Lama. Long-time student Bill Kane recorded Rinpoche in his cave and has posted the video on YouTube. Rinpoche, who was born not far from Lawudo, talks about his early days.